ST. PETERSBURG, Fla. - Tampa Bay has found success with pitching, defence and just enough clutch hitting. Evan Longoria homered and Erasmo Ramirez got help from four relievers in pitching the Rays past the Los Angeles Angels 4-2 on Wednesday night. "To win games and be the type of team that we want to be, we've got to do that more times than not for sure," Tampa Bay manager Kevin Cash said. "Rarely are we going to make many mistakes and get away with it." 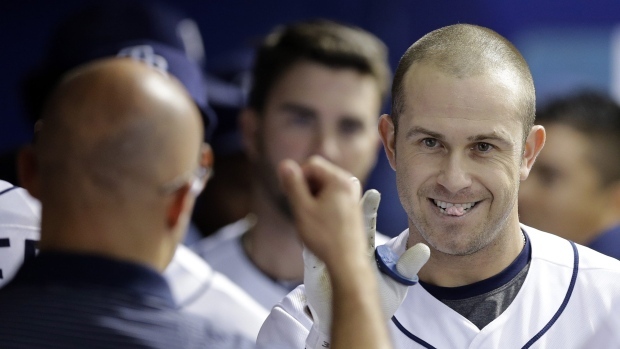 Longoria, who started at third base after being held out of the lineup the previous three games due to a sore left wrist, put the Rays up 3-2 with a solo homer in the third inning off Jered Weaver (4-6). It was just his second home run in his last 28 games, and sixth this season. Ramirez (5-2) gave up two runs and five hits over five innings in winning for the fifth time in six starts. Steve Geltz, Kevin Jepsen, Brad Boxberger and Jake McGee, who pitched the ninth for his first save, held the Angels to two hits over the final four innings. Tampa Bay has gone 8-3 in its last 11 games despite averaging 3.6 runs. Weaver allowed four runs and eight hits over 7 2-3 innings in falling to 4-1 in six starts at Tropicana Field. "He gave us a chance to win and unfortunately we couldn't get much offence going," Angels manager Mike Scioscia said. Los Angeles has lost six of seven. Asdrubal Cabrera made it 4-2 with an RBI double in the eighth. Kevin Kiermaier had a run-scoring single in the Rays' two-run second. Nick Franklin scored the other run when third baseman Kyle Kubitza, playing in his first major league game, decided not to throw to first base on Joey Butler's two-out grounder and instead forced Kiermaier to retreat back to second, where he was thrown out. "It was a little unusual," Cash said. "I think K.K. being on second, busting it toward third, probably got in the guy's eye. Just got caught in-between. A lot of good things on that play." Kubitza called it a bad play on his part. "As soon as I threw it to second I thought to myself I don't know what I'm doing," he said. "I should have thrown to first." Kubitza did have two hits in three at-bats. The Angels tied it at 2 in the third on consecutive RBI singles by Erick Aybar and Mike Trout. Kiermaier made a diving catch in centre field on Albert Pujols' liner in the eighth. Pujols went 0 for 3 despite hitting the ball hard all three times. Tampa Bay has held opponents to no more than two runs in 30 of 60 games this season. Angels: 3B David Freese, who left late in Tuesday night's 8-2 win over the Rays, struck out as a pinch-hitter in the ninth. Scioscia hopes Freese might be able to play defence in a few days. Rays: OF Desmond Jennings had arthroscopic surgery on his left knee and is expected to miss eight weeks. Ramirez had gone 25 winless appearances, including 15 starts, before his current stretch of success. His ERA has dropped from 25.31 to 4.96. Angels RHP Garrett Richards (5-4), scheduled to start Thursday night, is coming off an outing Saturday in which he allowed a season-high six earned runs over two-thirds of an inning to the New York Yankees. He will face Rays RHP Alex Colome (3-2).